Home Retirement Planning	What’s the “New” Retirement Age? About a quarter of our readers agree, stating they plan on breaking up with their cubicles before age 60. Sipping margaritas on the beach instead of sitting in ANOTHER boring meeting is tempting – especially when you’re young and have the energy (and good health) to do so. But early retirement isn’t all fun in the sun. With so many scary statistics about America’s savings crisis, running out of money is a very real fear. Not only that, but you risk depression, boredom or worse, death. In fact, according to research from the National Institute on Aging, working an additional year after age 65 lowers your mortality risk by 11%. If you put off retirement – as 27% of you plan to – you could stay healthier (both mentally and physically) and keep money flowing into your savings account longer. Meaning you’ll have a much larger nest egg when you do choose to retire. But then again, the more years you work, the less time you’ll have to actually enjoy your golden years. After decades in the workforce, those years are well earned and well deserved. And spending your later years without worrying about deadlines or rush hour is what everyone wants… right? We just hope you’re staying at work because you love your job… not because you can’t afford not to. The average retirement age? Who wants to be average anyway. The bottom line is that there is no “perfect” age to retire. 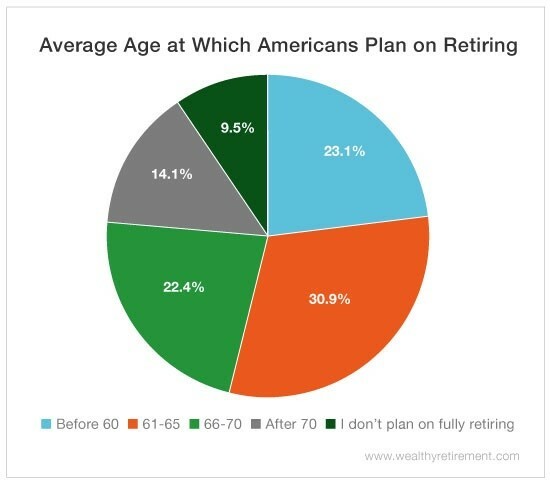 It all depends on what YOU want your life (and retirement) to look like.